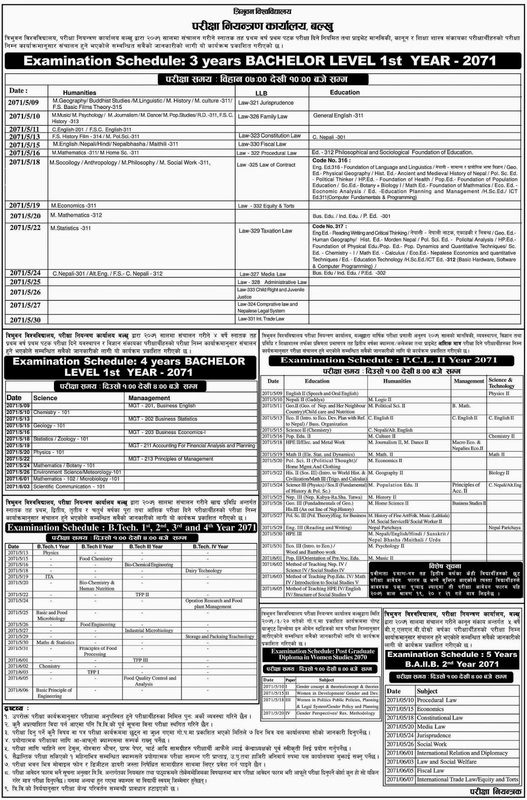 Tribhuwan University , Office of the controller of Examination, Balkhu has published the exam schedule of 3 Years Bachelor Level 1st year-2071 for Humanities, Education and LLB and 4 years Bachelor Level 1st Year-2071 for Science and Management, Examination Schedule for P.C.L II Year 2071, Examination Schedule for B.Tech 1st, 2nd, 3rd and 4th Year 2071, Examination Schedule for Post Graduate Diploma in Women Studies 2070 and Examination Schedule for 5 years B.A.LL.B 2nd Year 2071. This notice is applicable for both regular and private students and also for chance examinee. For more detail see the notice below.